It is imperative that all pilots understand the basic principles of weight and balance determination. The following methods of computation can be applied to any object or vehicle for which weight and balance information is essential. By determining the weight of the empty aircraft and adding the weight of everything loaded on the aircraft, a total weight can be determined—a simple concept. A greater problem, particularly if the basic principles of weight and balance are not understood, is distributing this weight in such a manner that the entire mass of the loaded aircraft is balanced around a point (CG) that must be located within specified limits. 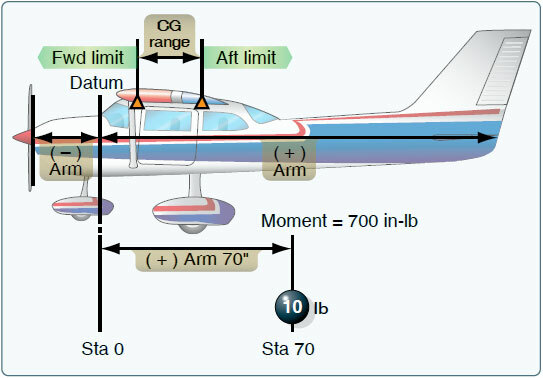 The point at which an aircraft balances can be determined by locating the CG, which is, as stated in the definitions of terms, the imaginary point at which all the weight is concentrated. To provide the necessary balance between longitudinal stability and elevator control, the CG is usually located slightly forward of the center of lift. This loading condition causes a nose-down tendency in flight, which is desirable during flight at a high AOA and slow speeds. Figure 10-2. Weight and balance. The distance from the datum to any component part or any object loaded on the aircraft is called the arm. When the object or component is located aft of the datum, it is measured in positive inches; if located forward of the datum, it is measured as negative inches or minus inches. The location of the object or part is often referred to as the station. 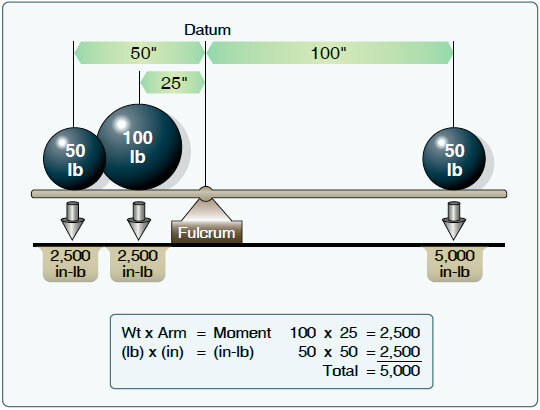 If the weight of any object or component is multiplied by the distance from the datum (arm), the product is the moment. The moment is the measurement of the gravitational force that causes a tendency of the weight to rotate about a point or axis and is expressed in inch-pounds (in-lb). To establish a balance, a total of 5,000 in-lb must be applied to the other end of the board. Any combination of weight and distance which, when multiplied, produces a 5,000 inlb moment will balance the board. 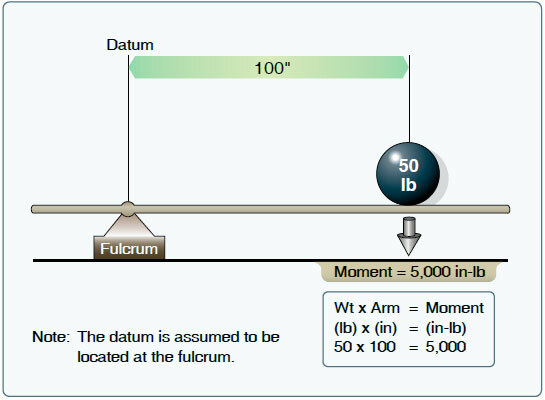 For example (illustrated in Figure 10-4), if a 100-pound weight is placed at a point (station) 25 inches from the datum, and another 50-pound weight is placed at a point (station) 50 inches from the datum, the sum of the product of the two weights and their distances total a moment of 5,000 in-lb, which will balance the board. Figure 10-4. Establishing a balance. An aircraft’s weight and balance restrictions should be closely followed. The loading conditions and empty weight of a particular aircraft may differ from that found in the AFM/POH because modifications or equipment changes may have been made. Sample loading problems in the AFM/POH are intended for guidance only; therefore, each aircraft must be treated separately. Although an aircraft is certified for a specified maximum gross takeoff weight, it may not safely take off at this weight under all conditions. Conditions that affect takeoff and climb performance, such as high elevations, high temperatures, and high humidity (high density altitudes), may require a reduction in weight before flight is attempted. Other factors to consider when computing weight and balance distribution prior to takeoff are runway length, runway surface, runway slope, surface wind, and the presence of obstacles. These factors may require a reduction in or redistribution of weight prior to flight. Some aircraft are designed so that it is difficult to load them in a manner that places the CG out of limits. These are usually small aircraft with the seats, fuel, and baggage areas located near the CG limit. Pilots must be aware that while within CG limits these aircraft can be overloaded in weight. Other aircraft can be loaded in such a manner that they will be out of CG limits even though the useful load has not been exceeded. Because of the effects of an out-of-balance or overweight condition, a pilot should always be sure that an aircraft is properly loaded.